Hi, as promised in my last post where I wrote about the scary world of project failures in IT, I am back today to help you avoid getting yourself in a similar situation. How so? By giving you a few tips on how to write better specs! Being able to capture requirements that are clear for both business and IT is a vital part of any Software project, yet I feel this part is often overlooked. As requirements are meant to convey the whole meaning of a project, this of course causes a lot of issues down the line. What are the signs that you might have insufficient specs? How should the specs look like? What should the specs be about? high technical debt. Technical debt can be born from inaccurate specs that lead programmers to implement things they do not fully understand or are not necessary, thus introducing additional complexity. Missing or Incomplete documentation. Good specifications often translate into good documentation as they should reflect precisely what the Software actually does. Failure to meet deadlines. You cannot expect programmers to implement a program in a timely fashion if you are not able to explain in plain English what the said program should do or not do. Angry users and angry programmers. The former complain because the Software does not do what it is supposed to (or does it in a very unintuitive and inefficient way). The latter complain because they were not given a fair chance to do good work. If you experienced any of those in the past, you might find some valuable information down there. We humans often fail at communicating in an accurate and effective fashion. This is even more true while using verbal communication. What’s the point of all this? Well, if you don’t want your application which ‘helps seniors share pictures of their pets in one click‘ to turn into a program that ‘takes photos of your dogs while they lick the pastor‘, then you’d better put those specifications on paper! Having written specifications is mandatory if you don’t want any important piece of information to be forgotten, lost, or even worse, misinterpreted. We all know the pain of sharing documents with 10 other people over email and exploding everyone’s mailbox quota. There were always moments when Jessica made modifications to final_specifications_january_v4-5-31_final_bis_draft1.docx while Gregory was already working for a few days on specifications_january_v4-5-37_lastest_final_bis_bis_2.docx. We all lost our sanity while editing a Word document in review mode, so full of red squiggles and comments that we needed a ultra-wide monitor to display it all. We despise SharePoint from the bottom of our soul. easily share your specs by sending an URL. quickly compare changes thanks to the built-in version control system. Comment and collaborate on the same document in near-real time. It is so easy to use that you might even start to like writing documentation! Writing specs is not going to be the sexiest thing you’ll do in your life, so make sure you have all the proper tools at hand to make your job easier. But whose job it is anyway? Let’s discuss it. No, programmers should NOT be the ones writing the specifications! Why so? Well, the programmers are the consumers of the specs. Their job is to thoroughly review the specs and find potential anomalies or inconsistencies in them before heading to the implementation part. They cannot do that if them wrote them themselves. Also, as we will see below, a programmer’s mind is programmed (pun intended) in a certain way that makes it difficult for him to write specifications that are truthful to the business. Having end users take part in capturing requirements seems like a no-brainer. After all, those are the ones the Software will be written for and therefore should have a say in its making. In practice though, this is not always the case. The reasons are various: they sometimes don’t have time for it, or worse, no one actually saw fit to ask for their opinion. Engagement of QA early in the project. Avoiding situations where programmers have to explain to the QA peeps what the Software should do, thus defeating the point of doing QA in the first place. Generally speaking, having a diversity of actors taking part in requirements gathering is a good thing and naturally contributes to having clear specifications. To sum up, having at least an end user, a business analyst and a QA specialist work together on the specs is a good idea. Good specifications should ideally contain enough information so none of the questions the programmers typically ask are left unanswered. What do programmers typically ask about? Let’s try to put ourselves in the shoes (and mind) of a programmer. Beware, sensitive souls refrain! Display the list of pizzas available on the menu. Add new pizzas to the menu. Remove pizzas from the menu. Yipee! We might think that this is enough to get development starting, but this is very far from the reality. Below is a non-exhaustive list of questions your programmers will sooner than later have to answer when they go down the development road. Does it have to be a desktop client? A website? a mobile application? What OS should it run on? What is the hardware available in the restaurants? Where should the data be stored? On a private centralized server? In the cloud? On the local machine? How will handle backups? Will the DEV team have access to a realistic test environment? How many pizzas should the application be able to handle? How many actions per second/hour/day/month should the system process? What are the expected response times from the system for each given action? How should the pizzas be displayed? In a grid or in a list? Maybe both? How many attributes (size, price, name, ingredients, …) should be displayed? How many pizzas should be displayed simultaneously on the screen? Are advanced UI functionalities required (responsive design, drag&drop…)? Should users be able to sort or filter the list of pizzas? Should the screen display pictures of the pizzas too? How can users log in to the system? Via password, smart card, badge, fingerprint…? Can users be assigned roles and permissions, e.g. standard user versus administrator? What are the validation rules to apply to a pizza? Should the application be available in several languages? Is an integration with the main website or any external system planned in the future? Can users edit several pizzas at once? Can users create a new pizza by copying an existing one? Can users delete several pizzas at once? Can there be two identical pizzas in the list under different names? Should there be an additional prompt message displayed when deleting a pizza? Is there any need for auditing capabilities (who created / edited / deleted pizzas…)? What is the expected granularity? Who is going to prepare the data for the migration? What are the differences in terms of data format between both systems? Who is going to run the actual migration from the old system to the new one? How will the migration be done? Database migration, manual insertion, custom interface and logic…? Programmers will realize that a big breaking change is required right in the middle of the implementation, because they did not foresee one specific case. This will introduce delays and technical debt in the project. Programmers will make decisions driven by the technologies (the languages, databases or frameworks being used) to compensate for the lack of guidance that should have been provided by the specifications. As you can see, programmers have many things to account for, and adding unclear business requirements to the balance might very well bring the project to his knees. Fortunately, you, as a specifications writer, can reuse the below collection of must-have items to ensure that your specs at least answer a minimum number of those concerns. It is very important to set the context and scope of a project straight from the beginning. The initial pitch mentions Italian restaurants (plural). How many of them are those? 3 or 300? Will the application be used in each of them? Gather the information and put it at the beginning of the specifications. Is the new PizzaManager application going to replace an existing system? If yes, what were the advantages and drawbacks of the old system? When is it going to be replaced? Why did they want to go with a new system? Answering all those questions on paper will help you identify a lot of hidden problems (read, hidden costs) and come up with appropriate solutions. Similarly, you must define who your team will be working with: does the client have his own IT or DEV team? Are they responsible for some of the project deliverables? Will your programmers have to interact with them in any manner?Identifying all the actors within the project is crucial, so as usual, gather the answers and write them down in the specs. The application pitch is full of nouns that you must explain in great detail. For instance, the concept of menu seems pretty blurry and should be clearly defined: The menu refers to the whole list of pizzas currently available for sale within the application. It is not related with the physical menus handed out to clients of the restaurant. Managers can delete pizzas and change their prices. Waiters can create and edit pizzas. They cannot change their prices. Pizzaiolos can only browse the list of pizzas and see their main ingredients. Removing a pizza will permanently delete the entry from the database. Removing a pizza will only make it disappear from the main list of pizzas on sale. It can be added back later on by a manager. Only managers can remove pizzas from the system. The system should not allow to remove the top 5 best-selling pizzas. A pizza should never contain both pineapple and broccoli at the same time! Those rules will allow your programmers to build the Software on stable foundations. Rules are usually easy to reason about and will bring sanity back in your DEV team. Log in the application and navigate to the main screen. Click on the Add button in the ribbon. The pizza creator wizard will appear as a popup. Choose the list of ingredients the pizza will be composed of. Click on the Create button at the bottom of the wizard. The pizza you created will now appear on the main screen. Writing down those scenarios will also help you verify that your immutable rules actually make sense! Additionally, there are a great starting point for your QA specialists. But do not stop at the happy path! If the connection to the main server was lost while creating the new pizza, the data should be stored locally until the connection is back. If you are currently editing a pizza that was removed from the system in the meantime, a notification should be displayed at the top of the screen: ‘the pizza you are editing does not exist anymore’. The general idea is to not let any element left to improvisation. Errors and failures will happen, so they should be taken into account in the specifications. Users are expected to create between 100 and 250 new pizzas per day. Around 40 users will be simultaneously logged in in the system at all times. Loading the the whole list of pizzas in the user interface should take more than 2 seconds. A pizza created in 1 restaurant should be available in the other 30+ restaurants after 1 minute at max. Data should be backed up 4 times a day. If you see metrics like those, you will know that what you are expected to build is not just another simple restaurant manager but in fact a complex piece of software with thousands of entities, near real-time synchronization between shops and a few dozen concurrent users logged in. That’s it for today. I hope I helped you understand why gathering requirements is such a vital part of Software development. Writing clear, complete and consistent specifications is not an easy job but the success of your project largely depends on it. Hopefully the ideas and concepts above will help you get started. Happy writing! I totally agree with your opinion on maintaining specs. 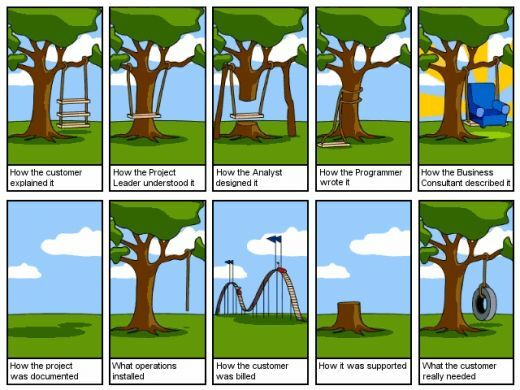 However, I’d wish myself and everyone that each company has analysts, PMs and Customers with technical knowledge enough to think about the projects on such levels, to be able to ask themselves kind of questions you proposed. Maybe that’s the problem in many cases, that “business” people, PMs and all people connecting development teams with business have no technical background ? Or their technical consciousness is on too low level for maintaining IT projects ? I believe a lot of factors come into play here. The one that you mentioned, the lack of “technical awareness”, is definitely one of them. However I don’t think this is the most problematic one. If you look at the list of questions above, you’ll find that very few of them are actual technical questions. For instance, the people writing the specifications do not need to know the difference between MySQL and MongoDB. It is better if they do, but that is not absolutely necessary. What they need to do though is ask the correct questions: what is the current daily traffic on your website? What are your expectations for the next month? How often do you want to get the updated sales report? The goal is to gather enough information so the programmers have a chance to make an informed decision and pick the correct tech accordingly. – lack of communication and ownership of the people writing the specifications. They “pass the baby” to the programmers who get blamed because “they are the ones who didn’t understand the specifications!”. – dishonesty toward the client. “Let’s lie to them about our actual capabilities by writing vague specifications so they sign the contract and we can all get our bonuses”. – lack of education and support from the management. If they gave bonuses for writing complete, consistent specifications, I am pretty damn sure people would put more effort into it. I guess we could make a parallel with Conway’s law here, that says “Any organization that designs a system will inevitably produce a design whose structure is a copy of the organization’s communication structure.” So basically, there is a chance that the specifications will reflect the culture of the organization :). I hope it partly answers your questions, let me know if you have another take on the subject :). Thanks for this comprehensive answer. I have however one more query on this topic: you state that programmers shouldn’t write the documentation. What about the technical dosc? Assuming you don’t do TDD where tests might be considered as well enough technical documentation. Should it be written at all and if yes, by who? Just to be clear, I stated that programmers shouldn’t be the ones write the specifications. If it comes to technical documentation however, then yes, the programmers should write it. Actually, they are probably the only ones with the skills to do so. They could also participate in writing user documentation, although it’s probably better if someone else can do this so the programmers can focus on what they’re paid to do – writing Software :). In the post I also mentioned that “Good specifications often translate into good documentation”. Specifications define what the Software should do. Documentation defines what the Software does. If the programmers did there job correctly, the two should end up being pretty similar :).